An unusual supernova unearthed in seven year old data may be the first example of a new type of exploding star, say astronomers publishing their results in the online journal Science Express this week. The supernova, dubbed SN 2002bj, could have resulted from a binary star system where helium flows from one white dwarf onto another and detonates in a dramatic thermonuclear explosion. White dwarfs are degenerate stars that have burned their hydrogen supply down to carbon and oxygen, or in some cases, helium. 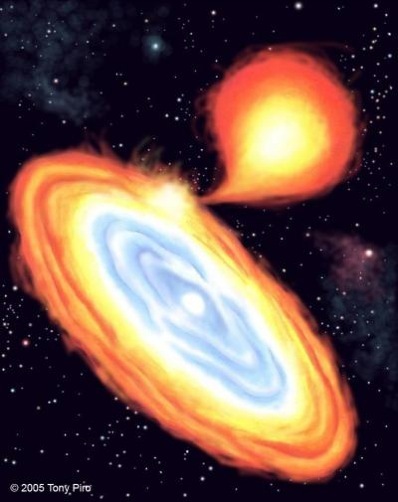 Artist's impression of a star system where helium flows from one white dwarf (upper right), onto another, piling up in an accretion disc around a small, dense primary star (bottom left). Helium from the disc eventually falls onto the star, forming a shell that may end up exploding as a "super" nova. Image: Tony Piro. 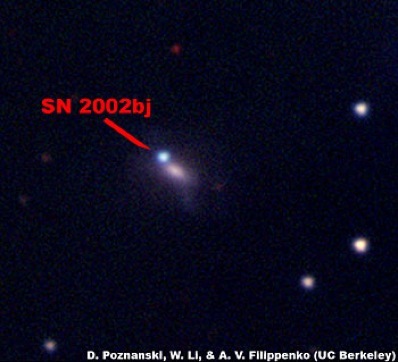 Within these two main supernova mechanisms astronomers have seen great diversity, but SN 2002bj is unlike any example ever seen before, and also the fastest evolving. “It was three to four times faster than a standard supernova, basically disappearing within 20 days. Its brightness just dropped like a rock,” says Lawrence Berkeley National Laboratory (LBNL) astronomer Dovi Poznanski. Usually supernova are visible for several months before fading from view. The exploding star SN 2002bj in the galaxy NGC 1821, captured by the Katzman Automated Imaging Telescope at Lick Observatory on 28 February 2002. Image: UC Berkeley. The supernova was first detected in 2002 in the galaxy NGC 1821 by the Katzman Automatic Imaging Telescope (KAIT) at the Lick Observatory, as well as by amateur astronomers, but was erroneously classified as a Type II supernova. While conducting a search through catalogued Type II supernova Pozanski stumbled across the spectrum of SN 2002bj, and realised the classification was a mistake. “Its classification was a mistake, which is understandable given the conditions of the data. But, of course, a redress of old data with fresh eyes is not usually this fruitful,” says Leonard. Properties that made the supernova stand out from the crowd were a strong signature of helium in the spectrum of the explosion, an absence of hydrogen, and the possible presence of vanadium – an element never previously identified in supernova spectra. No other supernovae spectra yielded such curious properties, leading the astronomers to assume that it belonged to a rare type of theorised supernova involving the detonation of a white dwarf star. Proposed by Lars Bildsten and colleagues at the Kavli Institute for Theoretical Physics at UC Santa Barbara, the theory involves a type of binary system composed of two white dwarfs, one of which is primarily made of helium and which is being slowly pulled by gravity onto its companion. When enough helium has been accumulated on the surface of the primary white dwarf, an explosion will occur that leads to a faint but rapidly rising thermonuclear supernova, about one-tenth as bright as normal Ia supernova. Also unlike typical Type Ia explosions, the white dwarf survives the detonation of the helium shell. SN 2002bj also shares similarities with a nova, which occur when matter (primarily hydrogen) falls onto a star and accumulates in a shell that can flare up as brief thermonuclear explosions. The astronomers are therefore referring to SN 2002bj is a “super” nova, generating about 1,000 times the energy of a standard nova. Such an explosion would have created heavy elements such as chromium, which decays to vanadium and then to titanium.